New South Wales, which contains Australia's oldest and most vibrant major city, Sydney, is the country's premier state. Breathtaking beaches and coastlines, World Heritage National Parks, a taste of the real Australian outback, snow-capped mountains, Aboriginal culture and dazzling city lights - all are on offer in New South Wales. Named by Capital Cook when he landed in Australia in 1770, New South Wales is Australia’s premier state. Home to the largest share of Australia’s population, New South Wales has a diverse landscape including palm fringed beaches, an awesome coastline, stunning National Parks, quintessentially Aussie outback, rolling vineyards and the Snowy Mountains. The main airport in New South Wales is Sydney’s International Airport. There are no direct flights to New South Wales if you're flying from the UK, however there is a great choice of airlines flying into this popular state via the Far East, Middle East and USA depending on which airline you choose to fly with. If you're after the cheapest flights to New South Wales, Australia, we recommend that you book as far in advance as is possible. The best deals on cheap flights are usually available in the quieter months for visitors to Australia such as during the Australian Winter (April-June). New South Wales boasts the bright lights of the beautiful city of Sydney with its incredible harbour, Opera House, beaches, shops, restaurants and nightlife. 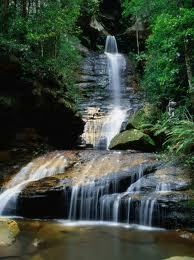 Close to Sydney are the gorgeous Blue Mountains with lush green scenery, gorges and great bushwalking. North of Sydney is the Hunter Valley, famous for its wineries and gourmet cuisine. Head further north to the laid back town of Byron Bay with its hippy vibe, exquisite beaches and surf culture. For a taste of the typical Australian outback, travel inland to Broken Hill also known as ‘Silver City’ due to its importance in Australian mining history. Surrounded by semi-desert, Broken Hill is also famous as a film location for the films Mad Max and Priscilla Queen of the Desert. The Snowy Mountains are full of wildlife and waterfalls and are a magnet for winter sports enthusiasts in the Australian winter. Some people have concerns that by booking cheap flights to New South Wales, Australia they will compromise on the quality of the airline they are travelling on or that their journey will be a lot longer due to more stops or changes of aircraft enroute. On the contrary, finding cheap New South Wales flights may mean that you incur a couple of stops or transits but airlines frequently release fantastic flight deals so you can still find some great offers. Not only can you benefit from a cheap flight to New South Wales but you will also have more money left over to spend on shopping, eating out or even to treat yourself to a room upgrade at your hotel. Directflights.com can help you find superb deals on low cost flights to New South Wales - just complete your requirements in our flight search box and we will check for the best available fares for you from over 500 travel and airline partners saving you time and money. If you need to book lastminute flights, we can also search for the cheapest available fares around.